HarborView is a 55+ community located in the beautiful city of Port Washington, New York. This active adult neighborhood provides all the amenities to keep homeowners socially active and physically fit, all the while enjoying a location that's across the street from the beach. HarborView also provides residents with single-family, attached, and condominium homes, which gives residents plentiful options for the perfect style home to suit their needs. With a sterling location on Long Island, HarborView has everything that active adults could want or need. At the center of HarborView is the clubhouse. An indoor pool and spa allows homeowners to enjoy a refreshing dip year round. A well-equipped fitness center gives active adults the resources to stay physically fit. The clubhouse also has a multi-purpose room and card room for socializing with neighbors or joining a club. Outdoors, HarborView has a pool and patio for making the most out of the warmer months. The community also has a transit bus for trips to local destinations. HarborView was developed between 2002 and 2004 and now has 270 homes. This 55+ neighborhood offers residents single-family, attached and condominium options. HarborView has 145 condominium units. These units range in size from 1,064 to 2,484 square feet and offers one to three bedrooms, one-and-a-half to three bathrooms, and two parking spaces. Some units boast golf course views, open floor plans, and plentiful sun light. HarborView offers a select number of attached homes. These options range in size from 2,364 to 2,884 square feet and have three bedrooms, two-and-a-half to three-and-a-half bathrooms, and an attached two-car garage. HarborView has several single-family homes that range in size from 2,371 to 3,440 square feet and typically have three bedrooms, two or two-and-a-half bathrooms, and an attached two-car garage. Some of these homes have dramatically tall ceilings, fireplaces, and spacious great rooms. Residents of HarborView enjoy a low-maintenance lifestyle with like-minded neighbors. The clubhouse is a popular option for enjoying an afternoon with friends or attending an event in the evening. There are regular exercise classes for homeowners to diversify their fitness routine. Thanks to a homeowners' association fee that covers snow removal, common area maintenance, and landscaping, residents have more time to do as they please. HarborView is located in the highly desirable city of Port Washington on Long Island. Just down the street from the community is a Whole Foods Market. Main Street in Port Washington, featuring boutique shops, restaurants, a movie theater, and cafes is also a couple of minutes away. St. Francis Hospital is less than a mile away. Interstate 495 is about ten minutes from HarborView while, for farther travel, JFK International Airport is about 20 minutes from the community. Port Washington is a highly desirable city thanks to its charming Main Street, beach access, and renowned restaurants. 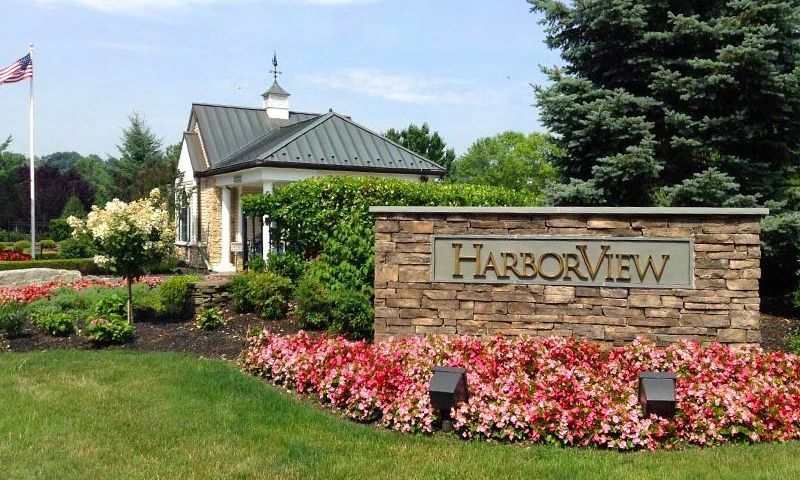 Golfers will love HarborView because Harbor Links Golf Course is directly across the street and Village Club of Sands Point is also a very short drive away. Big-city entertainment is also easily accessible with New York City less than 30 miles from Harborview, accessible via car and public transportation. HarborView provides active adults with everything they could need in a 55+ community on Long Island in New York. There are plenty of activities available in HarborView. Here is a sample of some of the clubs, activities and classes offered here. HarborView has 145 condominium units. These units range in size from 1,064 to 2,484 square feet and offer one to three bedrooms, one-and-a-half to three bathrooms, and two parking spaces. Please Note: Floor plans are not available at this time. HarborView offers a select number of attached homes. These options range in size from 2,364 to 2,884 square feet and have three bedrooms, two-and-a-half to three-and-a-half bathrooms, and an attached two-car garage. Please Note: Floor plans are not available at this time. HarborView has several single-family homes that range in size from 2,371 to 3,440 square feet and typically have three bedrooms, two or two-and-a-half bathrooms, and an attached two-car garage. Please Note: Floor plans are not available at this time. 55places.com is not affiliated with the developer(s) or homeowners association of HarborView. The information you submit is distributed to a 55places.com Partner Agent, who is a licensed real estate agent. The information regarding HarborView has not been verified or approved by the developer or homeowners association. Please verify all information prior to purchasing. 55places.com is not responsible for any errors regarding the information displayed on this website.